"It doesn't have to be true. It just has to be believed." 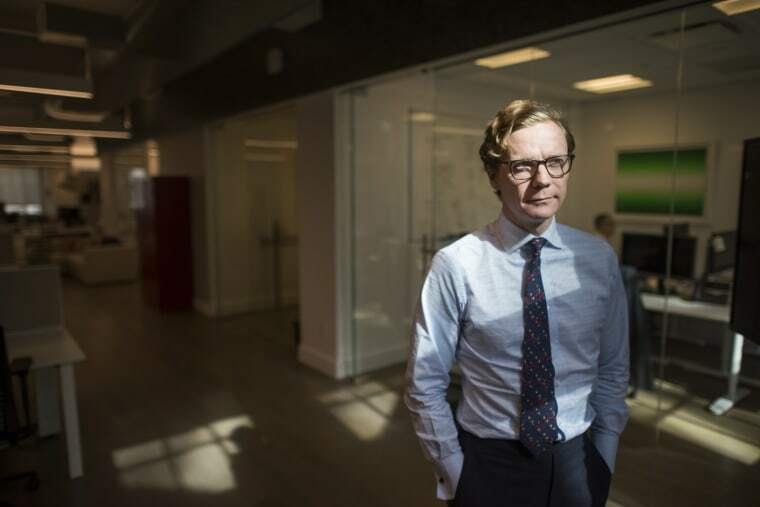 In a meeting with the head of Cambridge Analytica — the political data firm used by the Trump campaign in 2016 — reporters from NBC News’ U.K. partner ITN Channel 4 News posed as potential clients interested in changing the outcome of the Sri Lankan elections. The reporters, who were trying to find out how the company operated, quickly learned about the novel and deceptive methods employed by the company, including bribes, blackmail, and misinformation campaigns. The findings were broadcast by the network on Monday. On hidden camera, the reporters recorded Alexander Nix, chief executive of Cambridge Analytica, discussing the idea of hypothetically entrapping an opposition leader. He described how the company could record a person accepting a bribe, "an offer he can't refuse" or "send some girls around to the candidate’s house." Nix also floated the idea of spreading misinformation about politicians. "It doesn't have to be true," Nix said. "It just has to be believed." He later discussed creating fake IDs and having people pose as students or tourists as a way to further the political efforts without having its work traced back to clients. Mark Turnbull, managing director of Cambridge Analytica Political Global, was also recorded by the ITN Channel 4 News reporters discussing his relationships with former British spies now working at private companies who can be contracted to gather intelligence, along with private Israeli intelligence companies. Long a company of interest in the Trump-Russia investigation, Cambridge Analytica came under fresh scrutiny this past weekend after the company's former director of data research, Christopher Wylie, revealed how the company had mined data from at least 50 million Facebook users. Publicly, the company advertises its ability to build "psychographic" profiles that can microtarget social media political advertising to people based on traits like "extroversion" or "neuroticism." The company received a $15 million investment from wealthy Republican donor Robert Mercer, who also funded the conservative website Breitbart while Steve Bannon — who later became chief executive of Trump’s presidential campaign — was at the helm. A spokesperson for Cambridge Analytica denied to ITN Channel 4 News that it used any of the tactics discussed in the videos. “We entirely refute any allegation that Cambridge Analytica or any of its affiliates use entrapment, bribes, or so-called 'honey-traps' for any purpose whatsoever," the spokesperson said in a statement. “Cambridge Analytica does not use untrue material for any purpose,” the spokesperson added. Bannon met with Nix and was interested in how the profiles could be used to change American politics, Wylie said. "Steve wanted weapons for a culture war. We offered him a way to change the culture of America," Wylie told ITN Channel 4 News. Sources familiar with Cambridge Analytica’s work on the Trump campaign say “psychographics” were not used. A source familiar with the hiring of Cambridge Analytica told NBC News that the primary figures involved in the hiring were Jared Kushner and Brad Parscale, who was digital director of the Trump campaign. Parscale has denied that the firm was useful to the campaign and said the Trump campaign instead used data from the Republican National Committee. On Friday, Facebook suspended Cambridge Analytica from buying ads or administering pages on its platform on behalf of clients, saying its data policies had been violated. "We will take legal action if necessary to hold them responsible and accountable for any unlawful behavior," Facebook said in a statement, adding that it was investigating the claims. The developments drew rebuke from lawmakers on both sides of the Atlantic over the weekend. “Revelations that Cambridge Analytica secretly acquired the personal, private information of more than 50 million Facebook users without their permission or that of Facebook, must be thoroughly investigated," Rep. Adam Schiff of California, the top Democrat on the House Intelligence Committee, said in a statement. Sen. Amy Klobuchar of Minnesota, a Democratic member of the Senate Judiciary Committee, said Facebook CEO Mark Zuckerberg should appear before the panel to explain what the company knew about the misuse of its customers' data. Those calls were echoed by Damian Collins, a Conservative lawmaker in Britain leading a parliamentary inquiry into fake news and Russian meddling during Brexit. In previous hearings on the topic, the social media platforms sent their general counsel or policy directors. Facebook shares slumped 8 percent Monday.